The internet makes is easy to get information about registration, events and entertainment for this year's Rocky Point Rally. Passport and Travel Information to Rocky Point. New US travel rules in place. 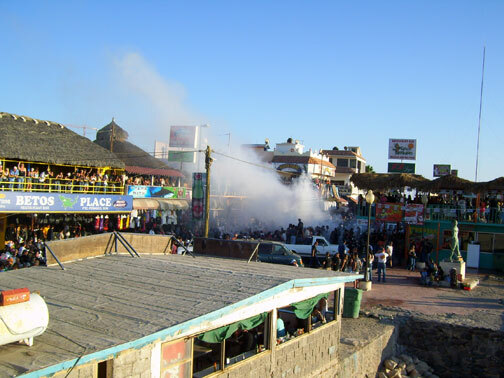 No, it's not a fire at one of the downtown restaurants in Puerto Peñasco. It's just someone burning rubber in the street. Photo by B. Zucker. More photos of the Motorcycle Rally. Full duplex communication between driver and passenger. Soft touch electronic volume control.Noise canceling microphones with Wind Block circuitry. Voice activated radio mute.Easily connects to optional FRS/GMRS radios and Cell Phones• . Product Dimensions: 12 x 9 x 2 inches ; 11.7 ounces.Shipping Weight: 1 pound. Note: Warranty does not cover misuse of product. Harley Davidson Mens Bulova Three-D raised Harley Davidson Eagle and Bar & Shield, bold red second hand, luminous hands, stainless steel case with classic stitched leather strap and hallmarked buckle. Water resistant to 50 meters. © 2007-2011 EMOL.org / Entertainment Magazine On Line / AZentertain. All rights reserved. Get Tons of Free Stuff!